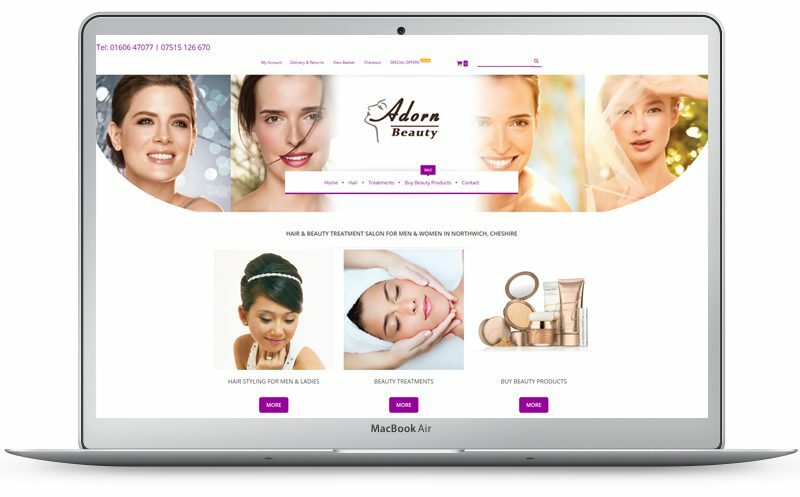 Adorn Beauty is a beauty salon that welcomes both male and female clientele. Adorn is located at Longworths Hairdressers and Barber in Lostock Gralam, Northwich, Cheshire, where the ladies and gents hairdressers has been open since 1951. The whole team offers a variety of treatments from the essential maintenance of waxing and electrolysis to more relaxing treatments of massage and facials. The stylists have been trained in London and also Vidal Sassoon trained. Thank you so much for my fantastic website! I have received so much initial business which turns into loyal clientele from it. Clients always mention that is it so clear, easy to read and the design suits the business well. It stands out well from the rest and I can determine whether people will enquire or not. My website comes up top on the search engine which does wonders for my business. Cheryl, as the business owner, was very professional, clear and extremely precise with attention to detail to ensure the website was exactly what I wanted. Since it has been running, the continual support is always there for me too which is great because I don’t know what I am doing with technology – its brilliant! I just leave it in Cheryl’s very capable hands! I would highly recommend her and Alpha Designs to everyone.